Sagittarius are characterised as optimistic and upbeat. They are always the first to see the positivity in all things and are known for their loyalty. They are also known for their cheerful personalities, as well as for their humour and wit and soliciting joy and laughter from people around them. Favourite hobbies include being outdoors, sightseeing and going on road-trips. Capricorns are also characterised as highly pragmatic. They are known as being ambitious and will strive for perfection. 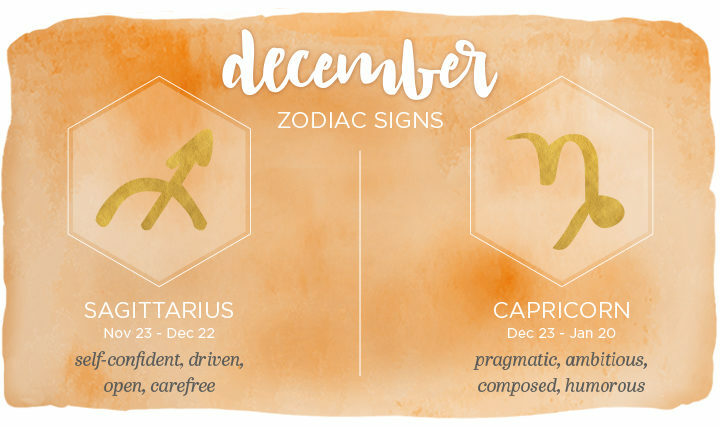 Although they can sometimes be blunt when it comes to expressing their opinions, Capricorns have an easy temperament and are excellent at maintaining their composure. Similarly, they are great listeners and are dependable friends.